The first of 20 offshore wind turbine foundations using suction bucket technology has successfully been installed at Borkum Riffgrund 2 in the German sector of the North Sea. On behalf of Ørsted, the first of 20 offshore wind turbine foundations using suction bucket technology has successfully been installed in the German sector of the North Sea. On June 2nd 2018, a team of specialists from NGI, Framo and GeoSea installed the first in a series of 20 suction bucket jackets (SBJ) at Ørsted’s Borkum Riffgrund 2 offshore wind farm in the North Sea. It is the first time Ørsted utilizes this type of foundation on a large scale in one of their wind farms. "Building on more than 40 years of experience in foundation design for offshore structures, NGI has actively and successfully transferred well-proven technology from oil and gas, to offshore wind. The successful installation of the SBJ on behalf of Ørsted is a milestone for NGI, and for the offshore wind business in general," says Thomas Langford, director for Offshore Energy at NGI. The Borkum Riffgrund 2 offshore wind farm will consist of 59 wind turbines in total, of which 39 will be supported using monopiles driven into the seabed as foundations, and 20 will use the suction bucket technology. “We are happy to finally see the installation starting. It has been a lot of preparation and work to get to this point. A strong team behind me did a great job so far, overcoming obstacles on the way and laying the groundwork for this next step. Now we want to make sure that the installation phase is executed in the best possible way,” said Peter Buhl, SBJ foundation project manager at Ørsted. The demand for renewable energy is soaring. The industry is constantly developing solutions to make wind energy smarter, more cost-efficient and more profitable for both developers and society. "The suction bucket jacket technology for offshore wind farms has gone from concept to reality during the last five years. Besides lowering costs due to the increased installation speeds compared to traditionally piled jackets, the concept provides for easier decommissioning and practically noise free installation," says Thomas Langford, director for Offshore Energy at NGI. The first of 20 offshore wind turbine foundations using suction bucket technology is lifted off the barge and ready to be lowered to the seafloor and penetrated by suction into the seabed. 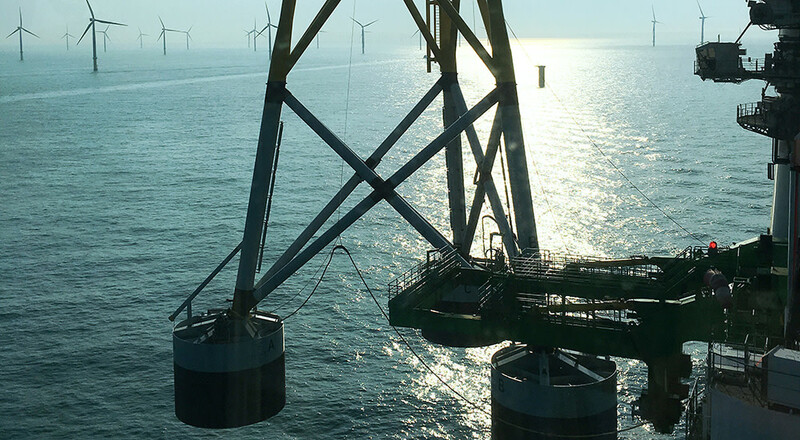 In 2014, Ørsted and NGI installed the first ever suction bucket jacket for an offshore wind turbine as a full-scale prototype in Ørsted's wind farm Borkum Riffgrund 1, next to the current Borkum Riffgrund 2 site. NGI also installed a comprehensive instrumentation for that project, and the successful measurements from the first prototype in 2014 laid the foundation for the concept applied to the current Borkum Riffgrund 2 wind farm. "This second installation is the next step for maturing the concept to be industrially applicable. This progress exemplifies the competitiveness and sustainability of offshore wind,” says Volker Malmen, Country Manager for Ørsted in Germany. The installation of the 20 suction bucket jackets, measuring more than 50 meters in height and weighing 950 tons in total each, will be completed during the next couple of months. The Borkum Riffgrund 2 wind farm is located 54km off the coast of Lower Saxony, next to one of Ørsted's other windfarms, Borkum Riffgrund 1. 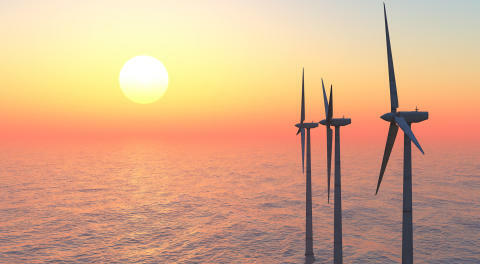 Each of the enormous 8,5 Megawatt turbines stands 109 meters tall above sea level and has a wingspan of 164 meters. Suction bucket foundation technology has been used to secure and safely anchor over one hundred platforms and offshore structures around the world. 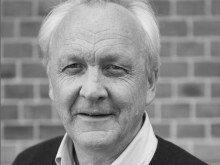 In 2015, three NGI pioneers – Knut H. Andersen, Rune Dyvik and Per Sparrevik – were admitted to the Offshore Energy Center's Hall of Fame in Galveston, Texas, USA, for their efforts in offshore foundations. Entire wind farms are being prepared for development utilising this pioneering technology harnessed from the oil and gas industry.